Right about the time that it became visibly obvious that something was brewing along Second Avenue in the spring of 2007 The New York Times published an article about the eventual possession and demolition of a corner building on 97th and 2nd Ave. Century Lumber sits on the southwest corner of the intersection and has been a local fixture for quite some time. Right across the street is the yard that took over the playground on Second Avenue and on the north side of 97th are Metropolitan Hospital and the Thomas Jefferson Housing complex, two institutions that will most likely not be moved for the T Line construction, though I am sure will be affected by the new traffic. Century Lumber however, though not according to the tenants, will see its end in a few short years. Having lived in the building next door for nearly a decade, the place has kept me employed in my part time pro-bono work of repairing my landlords building as I make improvements to our apartment(s). I have always been fascinated with New York and its inhabitants. I remember when we first moved in I purchased screens to stick in the windows for the summer months. Carrying them into work at the time I was looked at like I had a gun in my hand. My manager asked what I was doing and upon my explanation she laughed and said, “you can just ask your landlord.” Now, maybe I could have kept my $20 for the screens by asking and that, especially at the time, would have been a plus to the landlord/tenant relationship, but it was only the first of many instances over the years that made me realize just how many people are incapable of taking care of themselves in terms of their home. There are very few do-it yourself kind of fix-it people in NYC, so many call their super or landlord to do the most menial tasks. 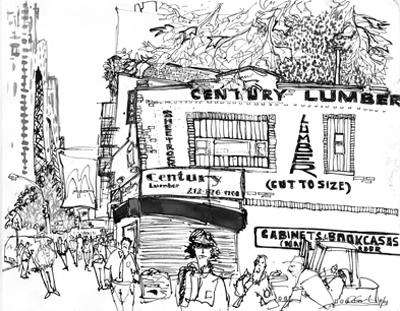 So as I drew Century Lumber last week during the UN visits by all the worldly, and Alaskan, visitors, I wondered if most of my projects would have had the same fate if Century had not been next door. Several dozen times I was able to run downstairs, unshowered and having yet to brush my teeth, and pick up what would consume me for the day. Would I have called my super or the landlord more often if the needed material wasn’t so close? Would I still be waiting to do certain projects? Would my windows have remained shut to keep out the bugs? I then wondered if the same people waiting for the M15 bus to arrive would still be waiting when Century is gone and the subway is in. On that day the 97th Street Limited Stop, having moved up from 96th Street for the construction, was crowded with waiting passengers staring up the avenue for the next bus. Being told by the rush hour bus stop coordinator that the UN traffic detours kept the buses from coming up 1st Avenue and therefore leaving no buses to make their way back down, several of the awaiting passengers negotiated the trip up the hill to the Lexington Avenue 6 Train. Most opted to wait, instead grumbling that it was taking so long. That morning was a good example of what reportage illustration brings to the table, or corner in this case. Too often, especially in New York City and I assume anywhere else as well, we do not stay in one location long enough to really evaluate it or the people who pass through. Drawing on site creates the opportunity of being center stage for the action, even if the action is waiting. Spending time at the stop last week I witnessed so many different reactions to the UN caused frustration: two people who had not seen each other in years running into each other and passing the time catching up; day laborers taking the break that they needed before the bus finally arrived; white & blue collar people trying to hold back what was now the moment the stress started for the day; the MTA bus driver relaxing against the fence waiting for the techs to come and resurrect his stalled bus; several elderly who really had no physical choice but to wait for the bus; and my favorite, an irrational neighborhood woman who stormed off after the first two buses were limited stops only. She was screaming about the fact that all the old people have been here waiting and carrying on about how no one was thinking about them. The truth was, she had arrived a few moments before the buses started pulling up to the stop (about an hour after I got there), so she no more knew who was waiting than the bus driver. Obviously she needed a local bus and didn’t want to wait the 2 minutes until it finally came. Stress brings out the true nature of people. Me, I probably would have walked away the moment the MTA bus coordinator informed everyone that it would be at least 15-20 minutes before the first bus arrived. If I had stayed, I certainly hope I would be the old co-workers catching up, but more than likely, whether it is next week or in ten years when I may only have to walk across the street to the subway station, I will be the guy standing in the center of the crowd drawing. At least I can only hope that is my fate most days.